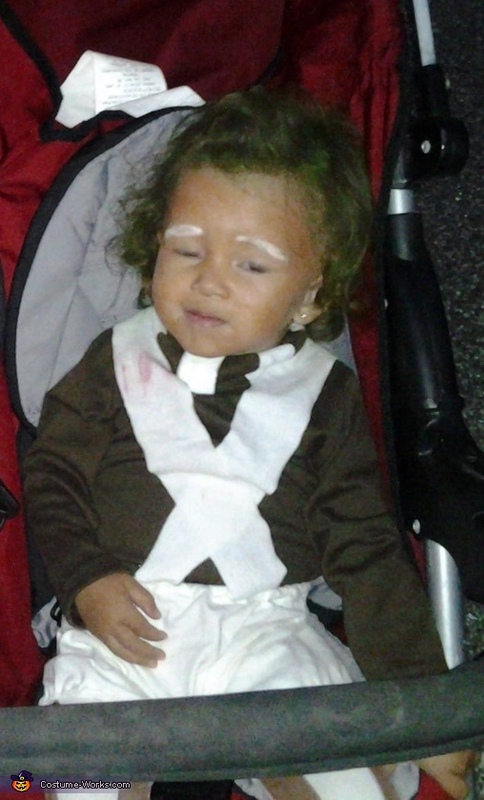 This homemade costume for babies entered our 2013 Halloween Costume Contest. My 1 Year old daughter Alexis is wearing her Oompa Loompa costume I made her, I bought a brown turtle neck $5 and some white stockings $3 along with brown and white fabric paint $10. A face paint kit and green "hair spray" $12. I cut up her older brothers plain white tee-shirt into some shorts and suspenders $0 ;) I used the white fabric paint to make the lines on the collar of the turtleneck and the brown paint for the lines on the white stockings.